Origin and Production. 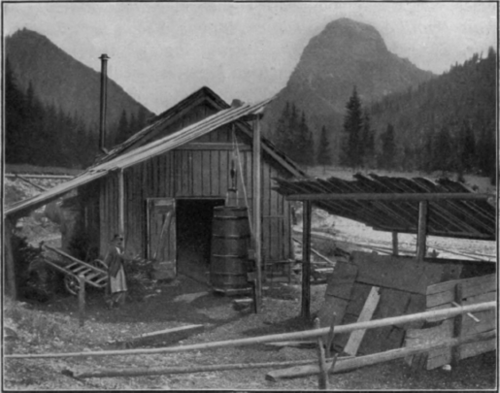 The so-called Latschenkieferol or Krummholzol is obtained by steam distillation from the fresh needles, twigs and younger branches of Pinus montana, Mill. (Pinus Pumilio, Haenke, Pinus Mughus, Scop., Ger. Latschen-kiefer, Zwergkiefer, Legfohre, Krummholz). The industry is located principally in the Austrian Alps, especially Tirol (Puster-tal, Imst, FernpaB, Kalkbachtal, Ampezzotal, Val Popena), in the southern parts of Lower Austria and along the northern border of Steiermark, also in the Tatra mountains in the neighborhood of the Green Lake. The yield is reported as 0,4 to 0,45 p. c. However, lower results are frequently obtained because of irrational methods of distillation. An experimental distillation conducted in Leipzig yielded 0,26 p.c.1) from fresh twigs obtained from Siebenburgen, and 0,68 to 0,71 p.c.2) from like material obtained from Hungary. The young wood without the needles yielded 0,27 p.c. of oil2). Finely cut material from Steiermark yielded 0,41 p. c.3). The distillation by Schimmel & Co. in Miltitz of twigs obtained from Innsbruck yielded 0,58 p. c.
1) Bertram and Walbaum, Arch, der Pharm. 231 (1893), 296. 2) Pharmaceutical Journ. 55 (1895), 162. 3) Bertram and Walbaum, loc. cit. 296. 4) Berl. Berichte 40 (1907), 4919. 5) Pharm. Ztg. 48 (1903), 574. 6) Report of Schimmel & Co. April 1907, 84. Fig. 17. Distillation of Latschenkiefer oil in the southern Tirol. Fig. 18. 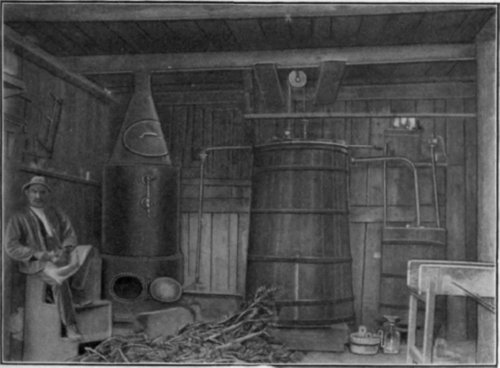 Interior of a Larschenkieferoldistillery. Properties. This oil has an agreeable balsamic odor. It is colorless and its sp. gr. varies between 0,863 to 0,875, that of Tirolese oils drops as low as 0,860. A specific gravity higher than 0,871 is frequently the result of oxygen absorption (resini-fication). The oils distilled experimentally at Leipzig cannot be regarded as normal, since the crude material must have dried out somewhat during the prolonged transportation. Hence their higher specific gravity, up to 0,892. The angle of rotation of normal oils fluctuates between - 4°30' and - 9°, that of Tirolese oils occasionally rises as high as - 15°20'; nD20o1,475 to 1,480; A. V. up to 1,0; ester content (bornyl acetate) 3 to 8 p.c; soluble in 4,5 to 8 vol. and more of 90 p. c. alcohol, occasionally with slight turbidity. When distilled fractionally nothing passed over below or between 160 and 170°, 70 p.c. between 170 and 185° 4). An oil distilled by Umney5) yielded 2 p. c. between 155 and 165°, 59 p. c. between 165 and 180°, 21 p.c. between 180 and 200°, 18 p.c. above 200°. 1) Report of Schimmel & Co. October 1893, 33. 2) Ibidem October 1896, 72. 3) Ibidem April 1906, 56. 4) Bertram and Walbaum, Arch, der Pharm. 231 (1893), 297. 5) Pharmaceutical Journ. 55 (1895), 163. Composition1). The lowest fraction contains but very little /-a-pinene2) (m. p. of pinene nitrolbenzylamine 122 to 123°). The succeeding fractions contain /-phellandrene (m. p. of nitrite 102°), sylvestrene1) (m. p. of dichlorhydrate 72°) and bornylacetate. The highest fractions contain cadinene (m. p. of dichlorhydrate 118°). Several new oxygenated constituents were found in the oil by E. Bocker and A. Hahn4). They examined an oil that had been freed from terpenes and sesquiterpenes (b. p. 85 to 178° under 13 mm. ), which they resolved into several fractions. From fraction 148 to 160° (aD - 14° 15'; S. V. 53) a solid bisulphite compound was obtained. From this a liquid having a faint balsamic odor and the elementary composition C15H260 was regenerated. With fuchsine in sulphurous acid solution it produces a red color. Presumably this substance is an aldehyde. From its behavior toward a glacial acetic acid solution of bromine the inference is drawn that it probably contains one double bond. From fraction 127 to 148° (13 mm.) the same investigators obtained a bisulphite compound which was decomposed with difficulty. There resulted a laevogyrate compound C16H240 with 2 double bonds, which appears to be a ketone. Finally fraction 87 to 95° (14 mm. ; d16o0,9288; aD - 18°15'; S. V. 65) was treated with sodium acid sulphite. A readily volatile oil was isolated that possessed the peculiar aroma of the Latschenkieferol. This interesting body possesses the following properties: b. p. 216 to 217° (754 mm. ); d15o 0,9314; d20o 0,9288; aD - 15°0'; nD 1,46459. It has the composition C8 H14O. On account of its high density and high boiling point Bocker and Hahn regard pumilone, the name given to this new substance, as a cyclic compound. It does not react with either sulphurous acid solution of fuchsine or ammoniacal silver solution. With potassium permanganate a mixture of two acids was obtained thus indicating the ketone character of the compound. Pumilone is a saturated compound and yields a semicarbazone melting at 116 to 117°. It is contained to the extent of but 1 to 2 p. c. in the original oil. 1) Bertram and Walbaum, Ioc. cit 297. - See also Buchner, Liebig's Annalen 116 (1860), 323. 2) First found by Atterberg and described by him as terebentene. Berl. Berichte 14 (1881), 2531. 3) The presence of sylvestrene in this oil was suspected by Atterberg. 4) Journ. f. prakt. Chem. II. 83 (1911), 489. Adulteration. A Latschenkieferol that attracted attention because of its low price was examined in the laboratory of Schimmel & Co.1). It was found to have been diluted with American turpentine oil as became apparent from the following results: d50o 0,8682; aD + 6°43'; E. V. 1,69 = 0,59 p. c. bornyl acetate; soluble in 7 vol. and more of 90 p. c. alcohol. Upon distillation (753 mm.) the following fractions were obtained: up to 160° 34 p. c, from 160 to 165° 36 p. c, from 165 to 170° 13 p. c, from 170 to 175° 3 p. c, from 175 to 190° 6 p. c, residue 8 p. c. The pure oil, when distilled in like manner, yields scarcely any fraction up to 160°.